The Barn is an absolutely great Halloween horror movie, a new genre classic that is destined to become essential annual viewing every October. I was lucky enough to get to see The Barn twice last year before its release on DVD, first at a private screening after it was submitted to our own Halloween International Film Festival and again with an audience at the festival itself, where it would go on to win awards for Best Halloween Film and Best Feature Film, and I loved it even more after the second viewing, ranking it sky high on the infinitely important rewatchability meter. Set on Halloween night in 1989, writer and director Justin Seaman more than succeeds in coating the entire film in retro-styled Halloween atmosphere that recalls its time period era, and evokes many of the warmest childhood memories of our favorite holiday, perfectly. Seaman proves to be a talented new voice with this highly satisfying first feature, and I definitely can’t wait to see what tricks he has in store next with his segment in the upcoming Halloween-themed horror anthology 10/31. Probably my favorite thing about The Barn is how much fun it is, following two pals navigating through what is likely their last Halloween before becoming “adults” and encountering an old curse that forces them to rely on everything they learned as wide-eyed horror loving kids in order to make it to another day. Mitchell Musolino and Will Stout are great as Sam and Josh, respectively, one of which (Sam) doesn’t ever want to outgrow the magic of Halloween, while the other (Josh) is getting grownup life forced on him. They have great chemistry that definitely rings true of a lifelong friendship that has reached a crossroads at a new stage in life. Sam has even developed his own set of rules for Halloween, some of which will be familiar to you but all of which you will surely start quoting soon. Lexi Dripps is also especially good as Michelle, the cool girl who has Sam’s heart, and it’s not hard to see why with her down to Earth approachability and killer good looks, but it’s her maturity in keeping the guys in check that solidifies her as a vital part of the team. Ari Lehman, who played the original young Jason Voorhees in the first Friday the 13th film, has a fun cameo appearance as a local TV show host named Dr. Rock, as does one of our all time favorite scream queens, the great Linnea Quigley (Night of the Demons, Return of the Living Dead, Silent Night Deadly Night), who plays the nagging Mrs. Barnhart. Colored in a blood orange haze from seasonal lighted decorations, the cinematography by Zane Hershberger is gloriously grainy to complete the vintage feeling that you’re watching a VHS tape, and no part of the frame is ever wasted but rather every inch is used to further deepen the holiday vibes, while the score by Rocky Gray rocks hard with ’80s-style metal that perfectly captures the mood set by the visuals. 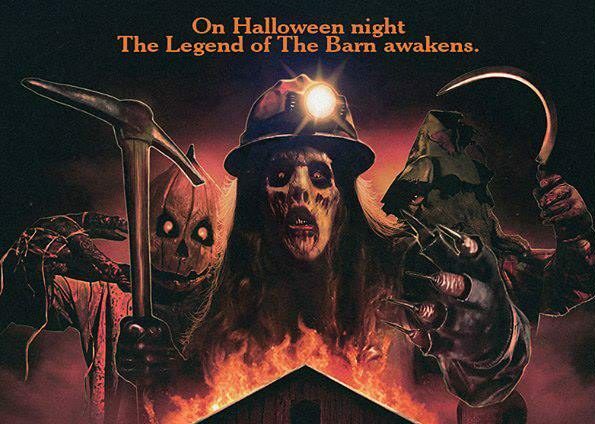 And I haven’t even gotten into the legend of the Barn itself, which goes back decades and introduces three unique new horror icons in the laughing Candycorn Scarecrow, the avenger of smashed pumpkins Hallowed Jack, and the deadly pickaxe-wielding former miner known simply as The Boogeyman. The gore is mostly minimal, but it creates a sharper jolt of violence when it does strike as such, and the special effects are delightfully practical and old school, just as it would have been if the movie was made around the year it takes place. Endlessly entertaining, the film is a flashback to the glory days of rollerskating rinks, rock concerts, and cheap plastic masks, sucking you in and taking you for a ride back to your fondest jack-o-lantern lit memories. It’s a rare feature that knows exactly what it is and embraces its tone fully, basking in autumn and begging for repeat viewings. Much more than just a throwback horror slasher, The Barn opens up a whole new mythology built around Halloween, and in doing so, it reminds us of why we fell in love with it all in the first place. The Barn, as well as tons of other related merchandise, is available in a two-disc Trick or Treat Edition DVD set, which you can order online here.